What a brilliant night everyone had at the Christmas party on Monday 14th December 2015! The evening kicked off with mulled wine on arrival and then we had the first session of dancing and hoe down with a live band which was hilarious fun. Next we had a lovely hotpot supper, desserts, wine and chocolates and the more dancing to work this all off. 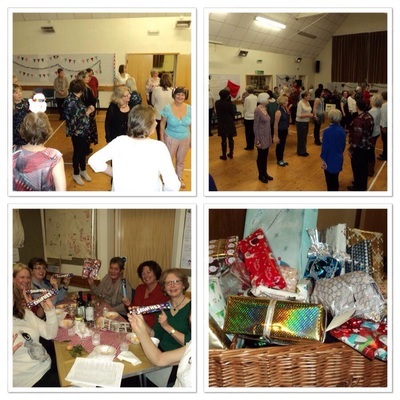 There was also a quiz, the raffle with 18 beautiful hampers as prizes and a Secret Santa. Thanks to Wendy and the committee who worked so hard to make this such a successful evening. * I'd just like to say a big thank you to you and all the committee for Monday - a great idea, plus for all your enthusiasm and dedication throughout the year! 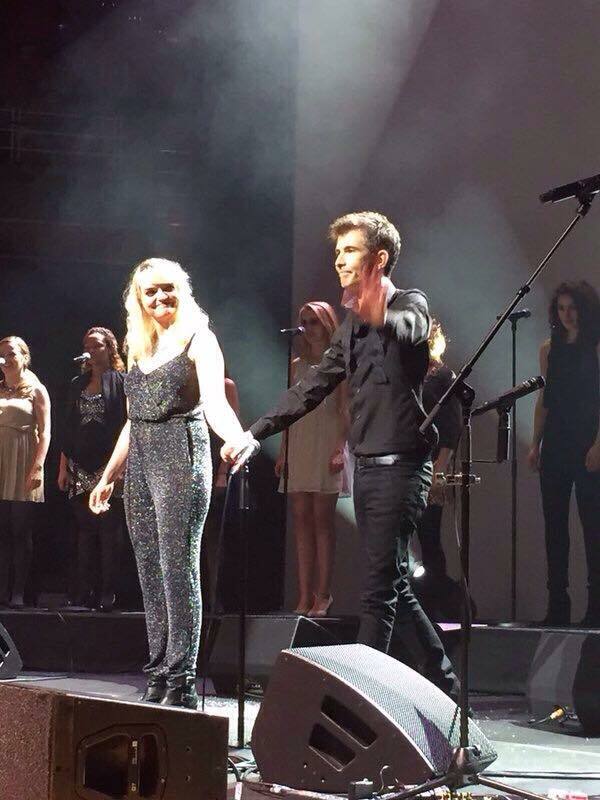 * Just wanted to say an enormous thank you to you and your team for a truly lovely evening. * What a lot of work must have gone into it to make it so perfect - I even won a hamper. Lucky me it was fabulous in a beautiful basket which, I'm told, came from Peru. * I also love our little list of programs and info. In fact it should be Wendy for prime minister in that you manage the funds so well with your cabinet, look after our club and,most of all, make sure that we are all friends. * Thank you, I enjoyed the evening very much. And the food was delicious. * Heaps of thanks to you and the committee for our wonderful, festive, jolly and delicious party! I appreciate your tremendous care, thought and effort to create a lively, lovely event. Have a very Merry Christmas! 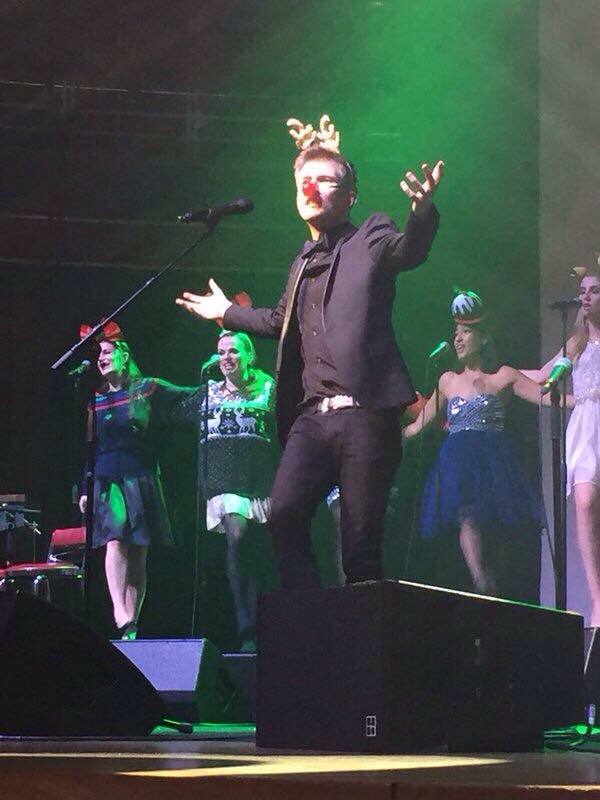 * Just wanted to say a huge thank you for a super time last night at the party. You and your committee had thought of everything. It was such fun to be Hoe Downing!!! The food and table decorations were lovely. * Thank you for the great Hoe Down last night. Lots of fun! And those hampers!!! * Brilliant evening, thanks everyone. Merry Christmas. 18 ladies enjoyed a great night out at the Bridgewater Hall on Monday 7th December 2015. Gareth Malone performed with his Young Voices choir and everyone was encouraged to join in as well. Several ladies had a lovely pre-theatre meal at Gio, kindly organised by Pat. Thanks go to Barbara for suggesting we go to see the performance. Mixed reviews for this month's book, The Hare with the Amber Eyes. Some people had read the whole book whereas others had only managed to get part way through. Nevertheless on the night, there was a great discussion about an interesting topic. 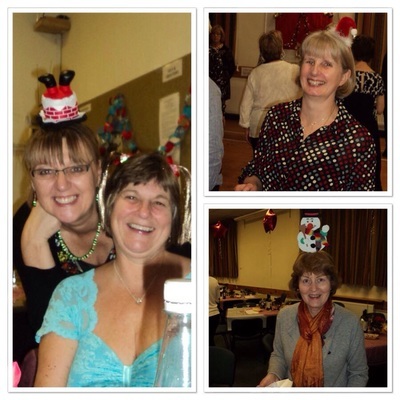 A group of ladies enjoyed Ten Pin Bowling at Macclesfield Superbowl recently and there were definitely some hidden talents discovered! As well as the bowling, everyone tucked into a bacon or egg butty and a hot drink. Great fun and thanks to Dee for organising it. 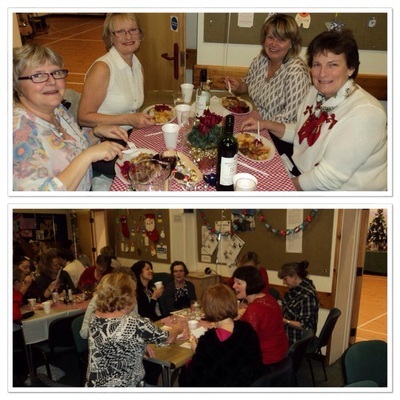 35 ladies enjoyed a delicious array of sandwiches, cakes and scones at The Clink Restaurant in Styal Prison on Wednesday 25th November. The Restaurant is one of a series of Clink Restaurants that have been opened in prisons recently to provide a unique training environment for prisoners, as well as being high quality restaurants for the general public to enjoy. At the end of the tea, Libby, who accompanied Alexander Devlin when she came and spoke to us earlier this year, gave us another short talk about her involvement with The Clink. 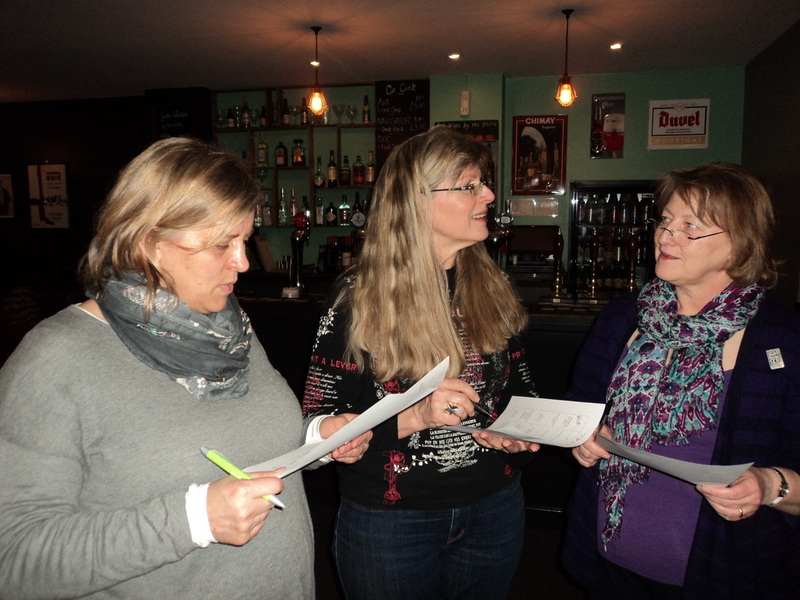 Over seventy members attended our AGM which must rate as the most lively meeting of this type in the vicinity! The three officers gave entertaining reports detailing the many meetings, events and outings in what has been a very busy Commemorative year. The Committee were re-elected and the Officers remain unchanged for 2016. After the formal business, the members voted for their favourite sweet and savoury biscuits. We had an opportunity to buy lots of goodies hand made by our talented members and look at our tree shortly to be displayed in the Christmas Tree festival. 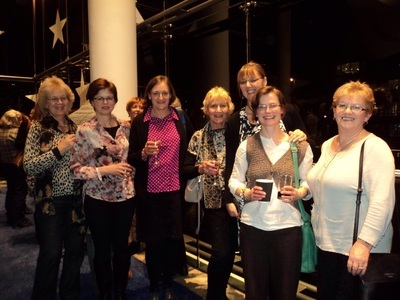 A group of seven of us enjoyed watching "Beryl - The Greatest Woman on Two Wheels" on Tuesday 3rd November at the Lowry Theatre. This witty, charming and critically acclaimed play, was written by Maxine Peake to celebrate the life of sporting legend Beryl Burton. Although very few people have heard of her, throughout her cycling career she won a multitude of events and her 12 hour time trial record set in 1967 has never been beaten by any other man or woman. 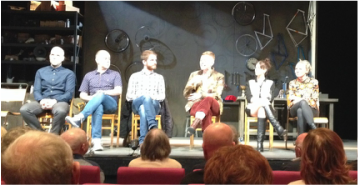 After the performance, we were invited to attend a post-show Q & A session at which all 4 actors and Maxine Peake answered questions and gave us some interesting insights into the play. Nine ladies enjoyed a glorious walk on Tuesday 27th October 2015. We set off from Wilmslow station and, blessed with bautiful sunshine, we made our way along some pretty footpaths whilst admiring the amazing scenery and some amazing houses as well! We walked along part of the Bollin Way before we headed back to Wilmslow to enjoy afternoon tea at Petit Delice. Thanks Jane for a lovely walk and for always taking us to new places. The chosen book this month, Us by David Nicholls, received mixed reviews by the 11 ladies that attended the Book Club on Thursday evening. Some found empathy with the characters, feeling sorry for some, whilst others found the book just a bit boring. There were also mixed views as to whether this was better or not as good as his previous novel, One Day. Some ladies felt it would make a great film and we had great fun deciding who would play the main characters from the book. 5 ladies enjoyed the last bike ride before Christmas on Wednesday morning. We left Twinnies Bridge car park and headed out, away from Wilmslow, towards and around Manchester Airport runway. With a few bicycle mishaps en route, we skirted around Wythenshawe, through some pretty parks, and then made our way to the café at the Airport Aviation Centre. Here we enjoyed coffee, cake and lots of conversation before making our way up the hill and back to Wilmslow. Thanks Jane! 11 ladies went to see 'Suffragette' at Macclesfield's Cinemac on Monday 12th October. This proved to be a harrowing, yet compelling film which centred on the early members of the British women's suffrage movement who took the law into their own hands at the turn of the 20th century. Their actions eventually resulted in votes for women in Britain plus other equal rights for women. 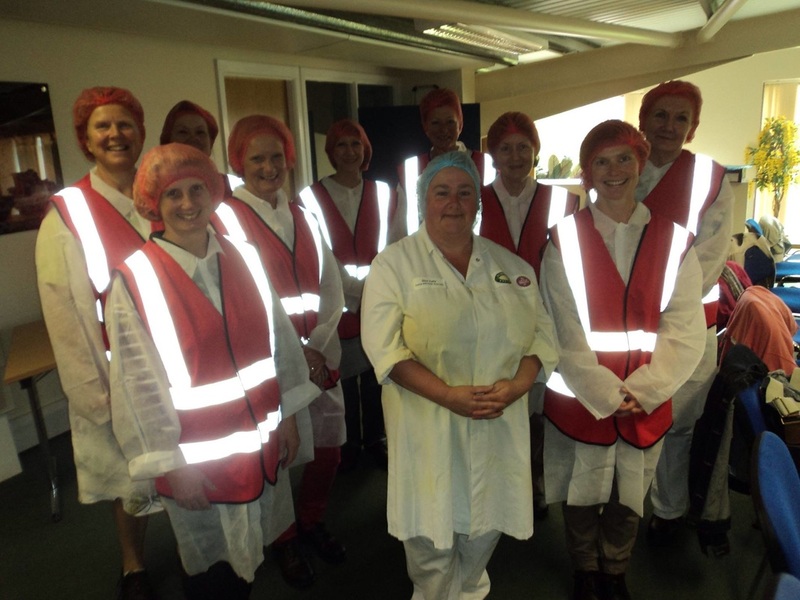 20 ladies enjoyed an informative and very interesting tour around Roberts Bakery, Northwich on Wednesday 7th October 2015. 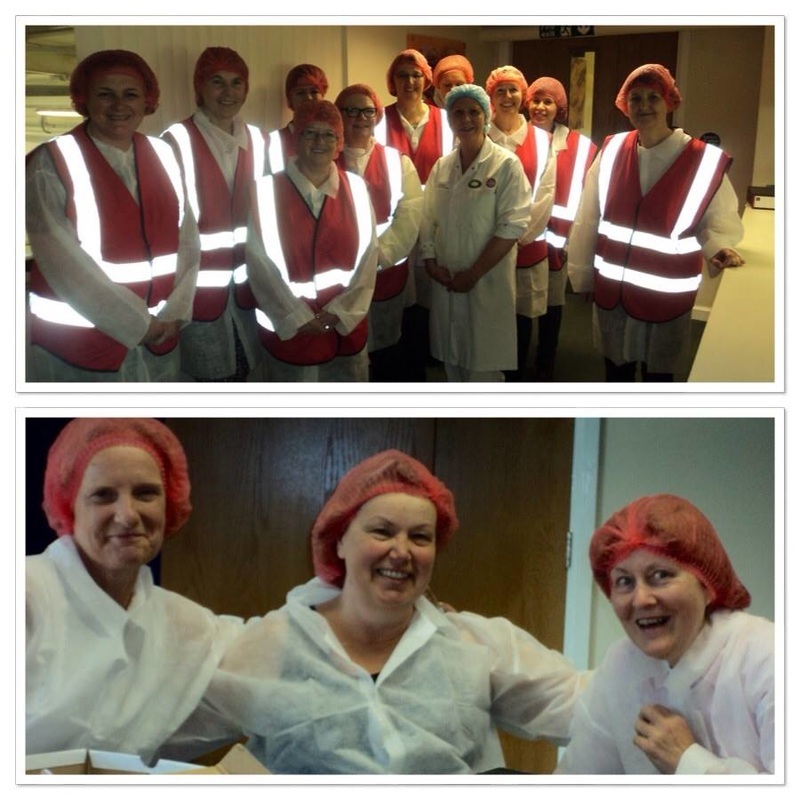 After being kitted out in very attractive white coats and red hairnets (! ), we were shown around the Little Treats Bakery which makes, amongst other biscuits and cakes, thousands of gingerbread men every day. We were then given a tour of the bread making factory where it takes just 3hours 30 minutes to make a loaf of sliced bread from start to packaging. Lindsey Occleston, who is a fourth generation baker, then gave us a brief but fascinating talk on her family business. We were all delighted to be given a bag of treats to take home. On Sunday, 4th October 2015, Sheila Parker took part in the Cardiff Half Marathon as part of the 15 strong National Federation WI Welsh team, joining ladies from across Wales and England. Sheila was the first lady home out of the WI team and she finished third lady in her age group in the race overall. 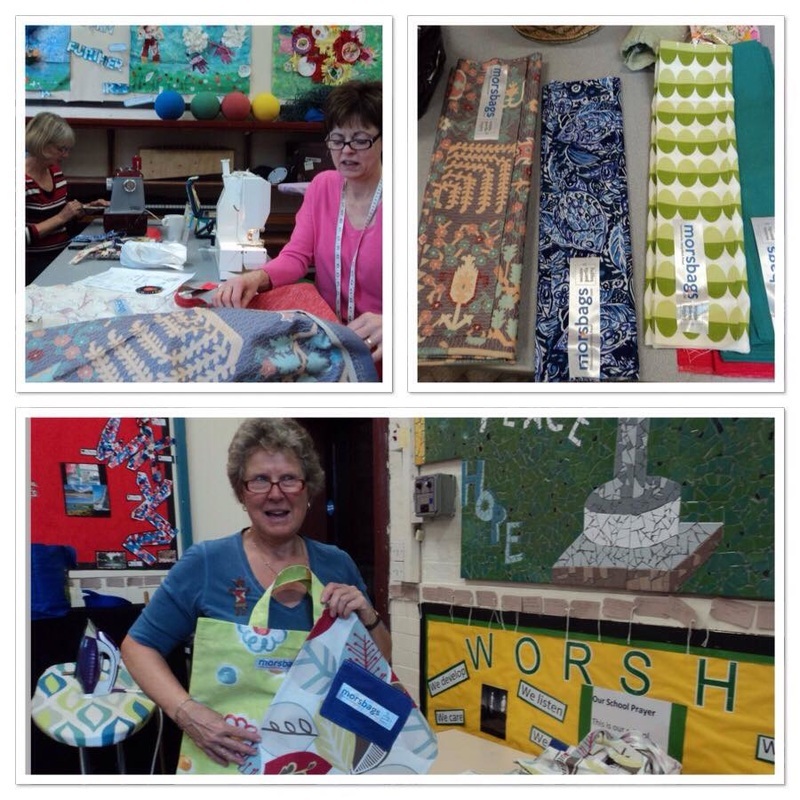 On Saturday 3rd October 2015, lots of members attended a Mors Bag making day and as well as enjoying great cake and conversation, they also raised the total of completed bags to 61. In addition to these bags, there are approximately 25 bags with members waiting to be sewn plus Amanda, who did a sterling job organising the day, has another 15 at home. All this means that we will achieve our target goal of 100 bags, 50 of which will be delivered to Food Friend on Monday 5th October, the day the charge for plastic bags is being introduced. Cottonopolis WI organised a Centenary Picnic at Heaton Park on Sunday 27th September and they were blessed with an afternoon of beautiful sunshine. Ladies from Cheshire and Lancashire Federations attended and enjoyed eating cake and drinking fizz as well as the other activities that were on offer. 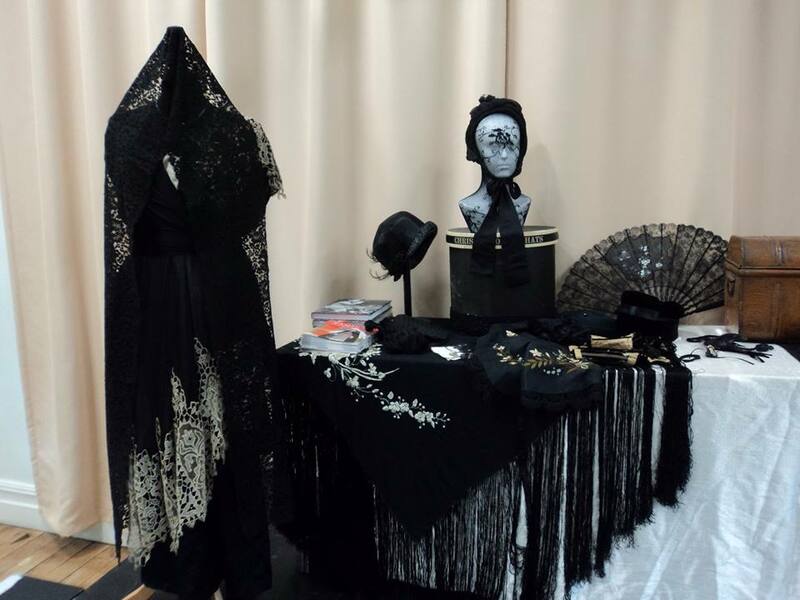 Several ladies from Fulshaw another presentation from History of Wardrobe, this time entitled Gothic for Girls which included 'shiveringly beautiful costumes and darkly dramatic readings from the best of British 'Gothic' writing'. 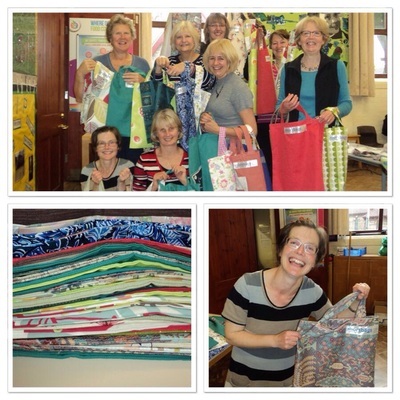 It all took place at Bollington Arts Centre and thanks go to Lorna for organising it. 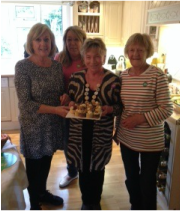 Jackie Rabone, ably assisted by Barbara Death, Kate Dewhurst and Susan Handley, hosted a Macmillan Coffee Morning (and afternoon) as part of the Macmillan World's Biggest Coffee Morning Event on Friday 25th September. 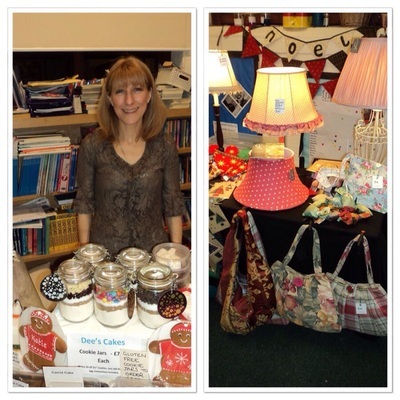 An array of delicious cakes were there to tempt us to add and lose pounds to our waistlines and purses respectively! Well over 50 people attended throughout the day including several Fulshaw WI ladies. 15 ladies, 2 husbands and 2 dogs enjoyed a pretty 5 mile walk on Friday 25th September. Despite threatening clouds, the sun shone and we walked around Dunham Park, Dunham golf course and the surrounding lanes and fields, and the enjoyed lunch at the Swan with 2 Nicks. John and Sandra Horsman brought along a number of Marionettes to show members and John gave a talk on the history of marionettes followed by the story their ‘Life with Marionettes’. He showed a series of pictures of the sets he had made and of the many puppets used in plays they performed. We had to handle the marionettes ourselves if we wanted to see them after the talk. They were clearly still passionate about their lifetime hobby. 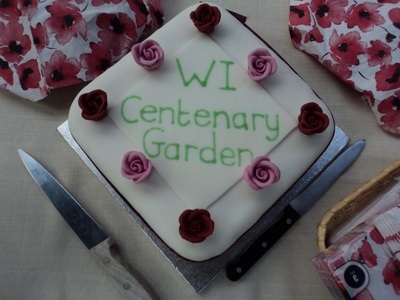 To celebrate the WI Centenary, Dee made a beautiful birthday cake and we were all given a piece to take home along with a key ring with a picture on it of the Centenary banner we made earlier this year. 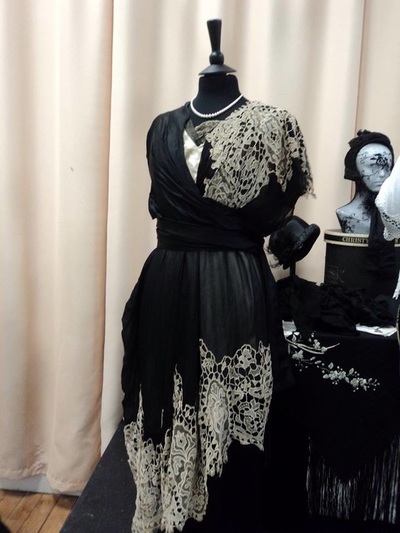 We were delighted to be invited by Cheadle and Gatley WI, as part of their Centenary celebrations, to see a showing of the highly acclaimed 'Little Black Dress' talk and fashion show, an inspiring story of how Aspull and Haigh WI created one dress, which converted into many, all using﻿ recycled garments. 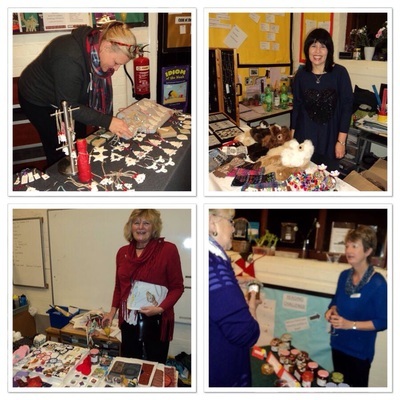 In addition to this, there were stalls, refreshments, a tombola, a raffle and 2 hilarious sketches to entertain the 105 ladies that attended. Five Brave Ladies Ready to Sky Dive! 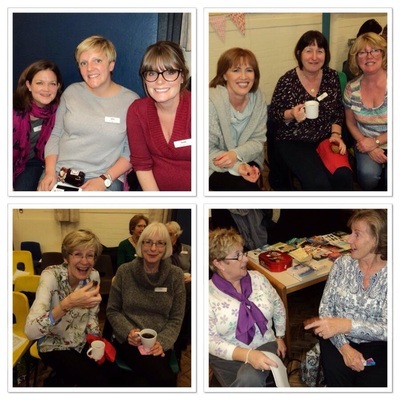 Five brave ladies from Fulshaw joined a total of fifty of local WI members who all took part in a two minute sky dive each to commemorate 100 years of the WI and to demonstrate how things have changed over the years. The dive took place at Air Kix on Thursday 17th September and those that took part said how much they had enjoyed it. BBC North West Tonight interviewed 4 ladies from other WIs that had participated and this was shown on TV the next day. The interview can be seen by clicking on this link. On Wednesday 16th September, invited guests and friends were present to see the opening ceremony of the WI/Incredible Edible garden. 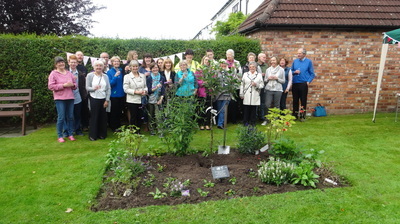 A ribbon was cut, a plaque about the garden was displayed and Wendy planted a centenary fruit tree. Jennie, who has worked hard on this project made a beautiful cake to mark the event and Amanda made some of her famous flapjacks. 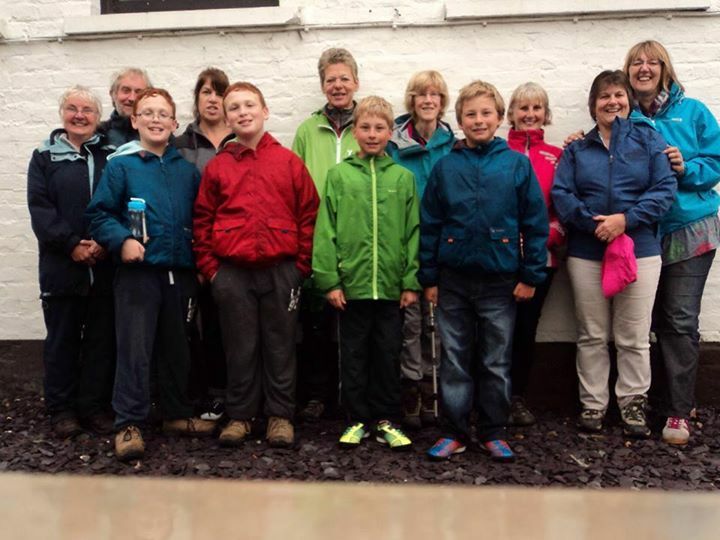 A great 5 mile walk on Thursday 27th September led by Jane. The walk started out from Twinnies Bridge car park at 10.15am with a coffee break en route. The chosen book this month was I Let You Go by Clare Mackintosh. The general consensus was that it was a real page turner, full of suspense, twists and turns. A great first novel by Clare and thanks to Cathy for suggesting it and leading the discussion. 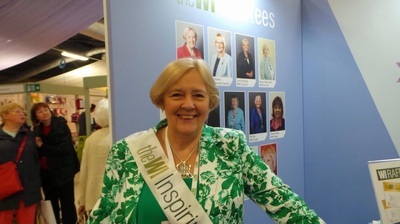 A bunch of intrepid ladies went to the WI Centenary Show at Harrogate on Friday 4th September. As you can see from the photos below, everyone had a great time. The cheerful group of walkers pose for the camera. We were delighted to welcome fifteen people, which included two sons, one daughter and a husband, to the evening walk on Wednesday 26th August. Jane led us on pretty and varied route, most of which we had not been on before. We left the Rifleman's and then headed out to Mobberley and the golf course, past Rossmere Lake and then back to the Rifleman's via the path near Ned Yates in the fading light. 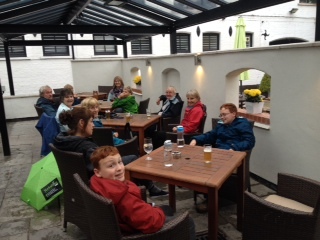 Some of the party enjoyed a drink in the pub before setting off home. ﻿﻿﻿﻿Eight ladies enjoyed a lovely evening bike ride on Monday 17th August. The sun was shining as we set off on the Alderley Edge bypass road and the headed out towards Chelford, admiring the beautiful scenery and grand houses. We then made our way back via Marthall and Ollerton and arrived back in Wilmslow, passing the Plough and Flail. The route was just over 12 miles long, with much of it on roads we had not been on before. A great bike ride and thanks to Jane for organising it. 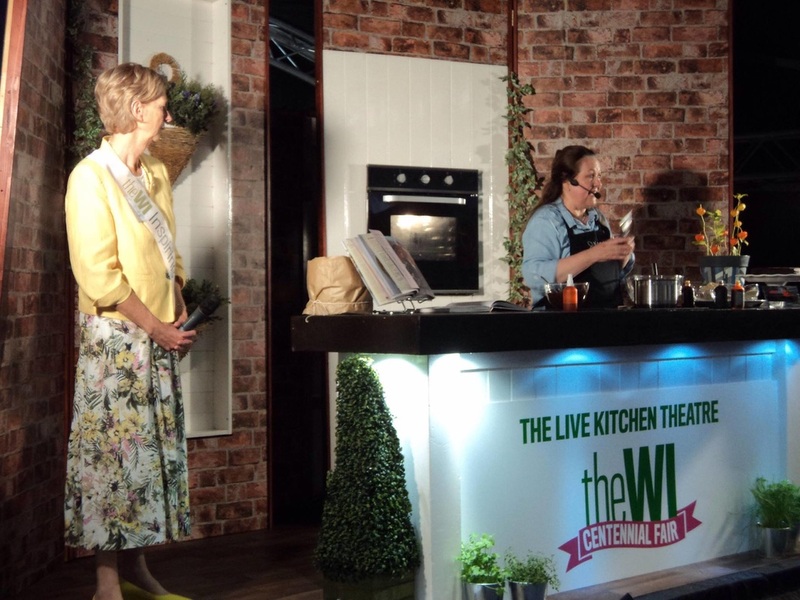 Sarah Pendle ﻿(sarah@seasoningworks.co.uk )﻿ presented a very entertaining and informative presentation about herbs and spices that can be used in cookery. Sarah distributed samples of 10 spices to all members of the audience to see if they could identify what they were and whether they tasted sweet, sour, bitter, salty, hot or umami. The garden when it began. The proud gardeners admire their handiwork. On Wednesday 29th July, one white currant, one blackcurrant and two gooseberry bushes were planted in our Centennial Garden. 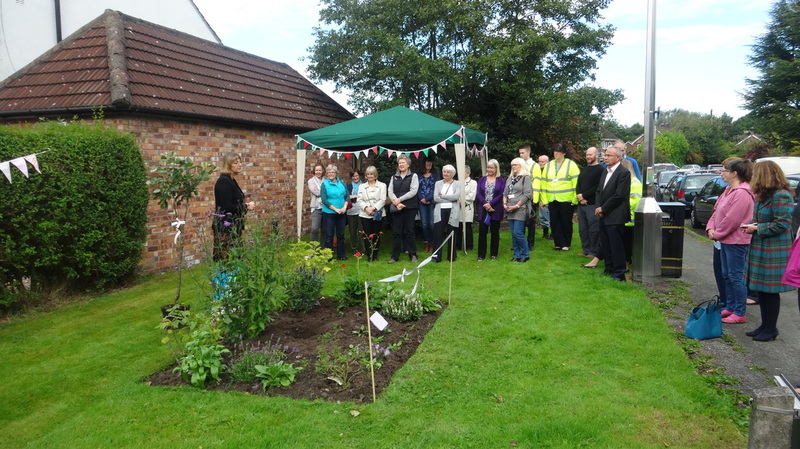 We look forward to watching the garden flourish and await the arrival of the plaque which will be placed in the garden as well the planting of an apple tree and a Centennial rose bush. 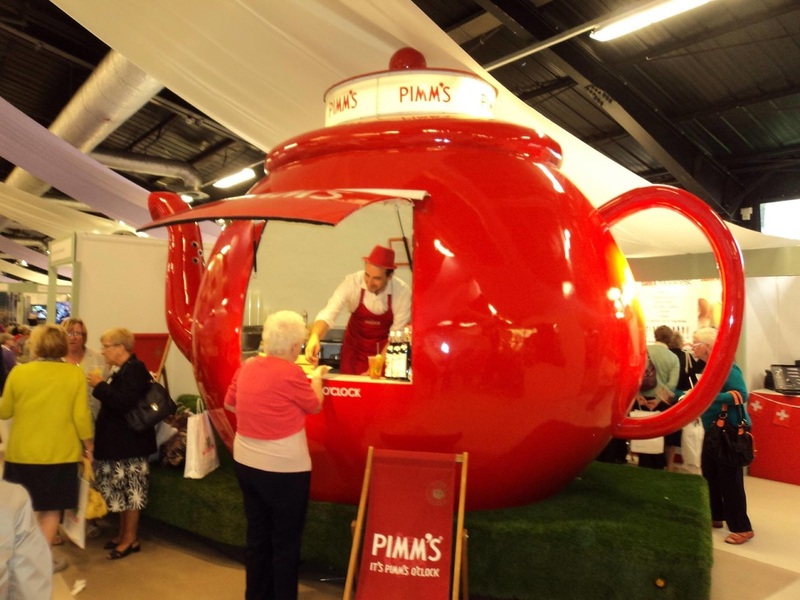 What a great time we had at Tea and Tents! Despite the poor weather, 12 hardy walkers turned out to join us on our Annual Family Walk. The weather improved slightly as we made our way towards Styal, walking through Styal Country Park. At Styal, we stopped at the The Ship Inn where the adults had some liquid refreshment whilst the children enjoyed ice cream. We then finished this circular walk by returning to the cars parked at Twinnies Bridge car park. Although we weren't blessed with the good weather we had last year, we all enjoyed the walk and thanks go to Jane for organising it. ﻿﻿﻿﻿﻿What a fabulous weekend we had! 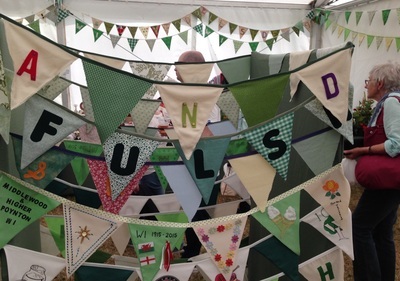 Six ladies from Fulshaw, namely Wendy, Jennie, Cathy, Amanda, Jane and Sheila, joined over 500 other WI members at Tea and Tents in Walesby Forest. The weather was kind to us, the camaraderie superb and between us we walked, ran, swam, were inspired by some of the wonderful talks given, learnt new crafts and skills as well as leading some of the activities and carrying out volunteer duties. And they call this fun? Whew, that's over for another year!! Several brave ladies tried their hand at kayaking for the first time on Thursday evening whilst others were grateful to have the opportunity to repeat the experience. Only one lady fell in and a second place was achieved in the pub quiz afterwards. Thanks to Hilly for organising the event. A thoroughly entertaining and yet thought-provoking evening. Lucy Adlington, assisted by Meridith Towne, entertained us with their performance of 'A Dress for Every Decade' which highlighted the role of women and the WI throughout the last 100 years. 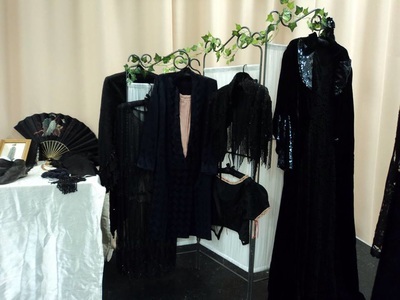 They illustrated the talk with a selection of the clothes that were worn during this period as well as sharing many amusing anecdotes with us, both rehearsed plus many 'off the cuff'. The evening was hosted by the Social Lites who treated us to tea, coffee and a superb selection of home baked cakes on arrival. 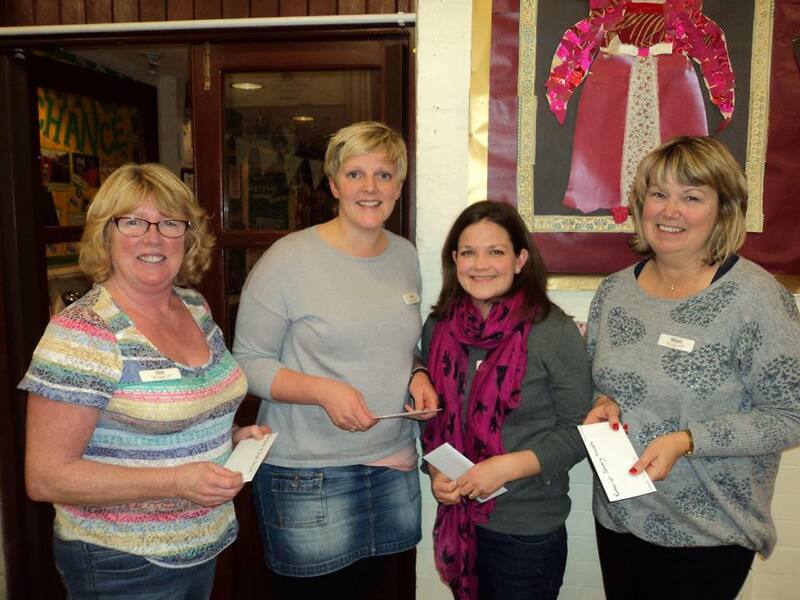 The evening was rounded off with a raffle, and 4 of the ladies from Fulshaw were lucky enough to win prizes. Who did sing Mouldy Old Dough?? Cheers - we had a good time even if we didn't win the quiz! 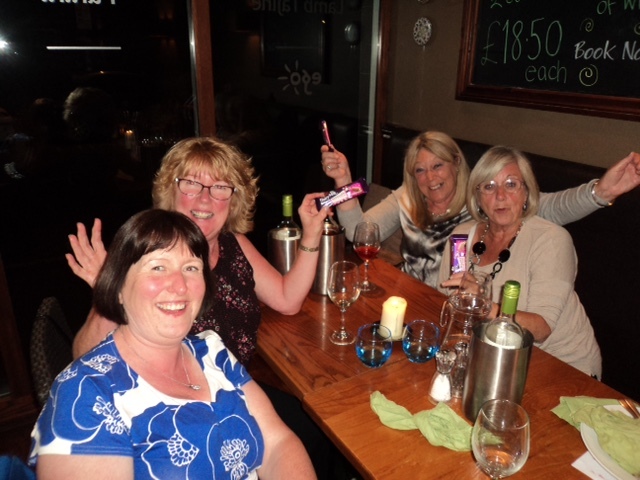 A great night at Ego Restaurant in Bramhall!! 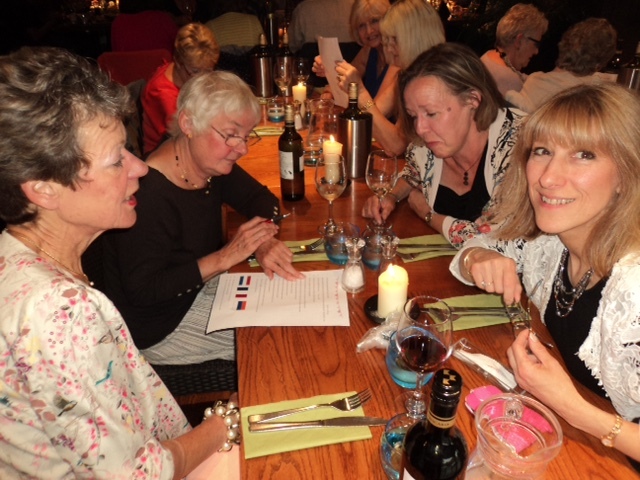 Twenty three ladies enjoyed the Monday night special at Ego Restaurant which consisted of a choice of 2 courses, a bottle of wine each and we were even treated to coffee on the house by Ego. As well as being wined and dined, Wendy had prepared a special quiz for us all which was won by the 'Back Corner Team' - Cathy, Dot, Barbara and Jackie. 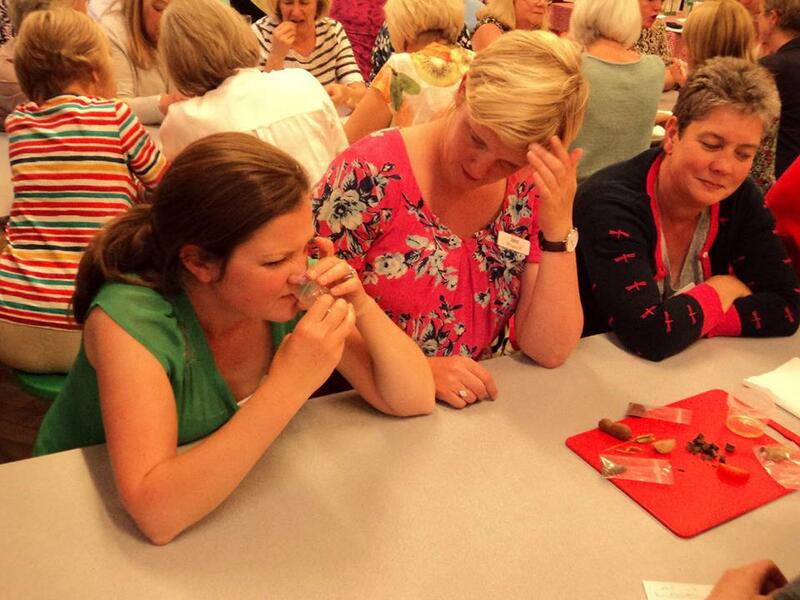 The winning and losing teams were awarded chocolate bars and, just in case we hadn't done enough damage to our waistlines with the meal, everyone enjoyed chocolates with their coffees, all kindly donated by Wendy. 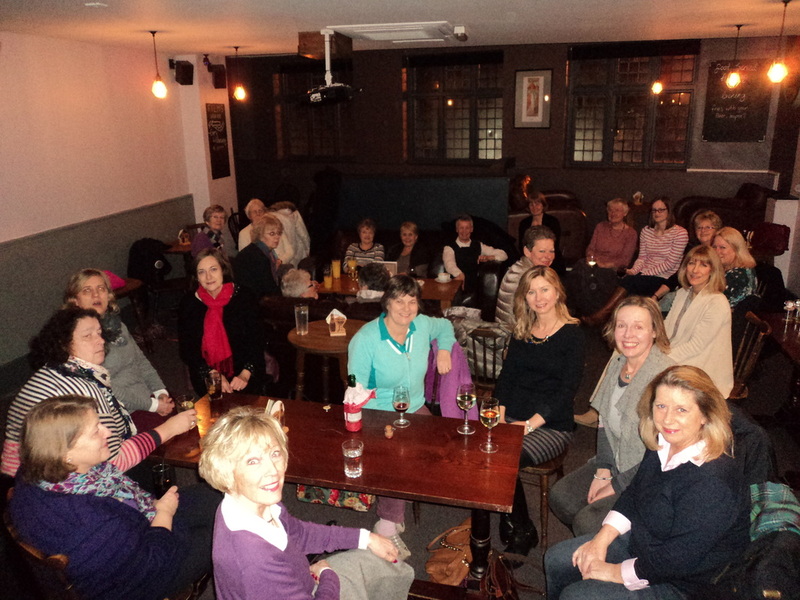 Fourteen ladies met on Thursday 9th July in the Rifleman's to discuss what they thought about the chosen book, 'Nora Webster' by Colm Toibin. The discussion was led by Liz and it is fair to say that the reviews and people's opinions were very mixed. Ladies who were familiar with the Irish setting of the book seemed to enjoy the book the most. In what has become an annual tradition, we were invited to Wilmslow High School to share with them in this community event. Eleven of us enjoyed a selection of sandwiches, cakes and scones, all prepared and served by the pupils, during which we were entertained with an assortment of musical performances. We look forward to next years invitation! ﻿﻿Eleven ladies from Fulshaw attended the 95th Birthday Celebrations of Cheshire Federation held at Gawsworth Hall on Tuesday 7th July. We were entertained by other local WIs, as well some of the Board of Trustee Members , all from the wonderful open air stage at Gawsworth. 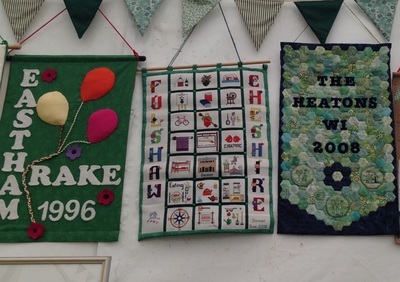 As well as this we also had the opportunity to look at all the beautiful banners and bunting that each WI in Cheshire had created for the recent Centenary Celebrations of the NFWI. 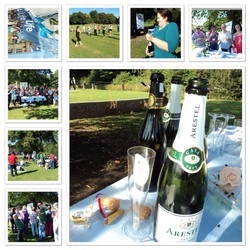 We then headed over to the main garden area to enjoy a lovely picnic, followed by a tour of the Hall. ﻿﻿Despite the heavy rain tin the afternoon, 4 brave ladies set off for an evening bike ride on Monday 6th July. 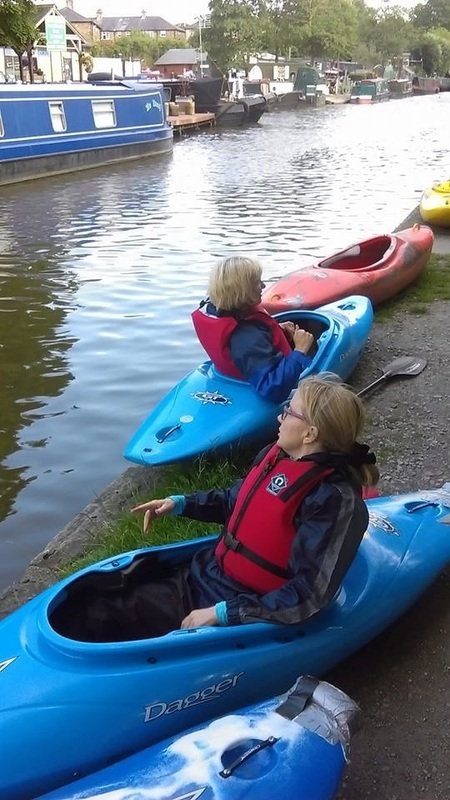 They were rewarded with an evening cycle with only very light showers and were able to enjoy the scenery as they cycled around the roads and paths of Wilmslow and Mobberley. 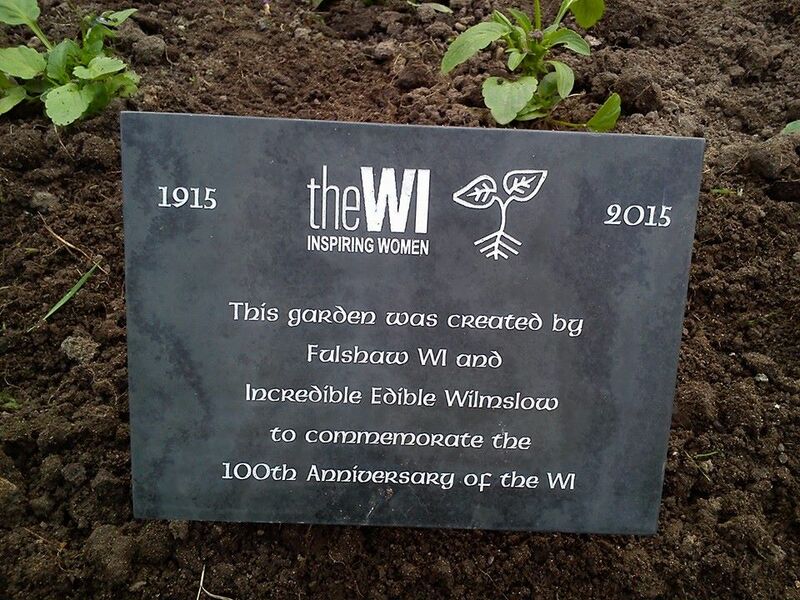 Saturday 4th July saw the beginning of the Fulshaw WI Centennial Garden, a joint initiative between Fulshaw WI and Incredible Edible. 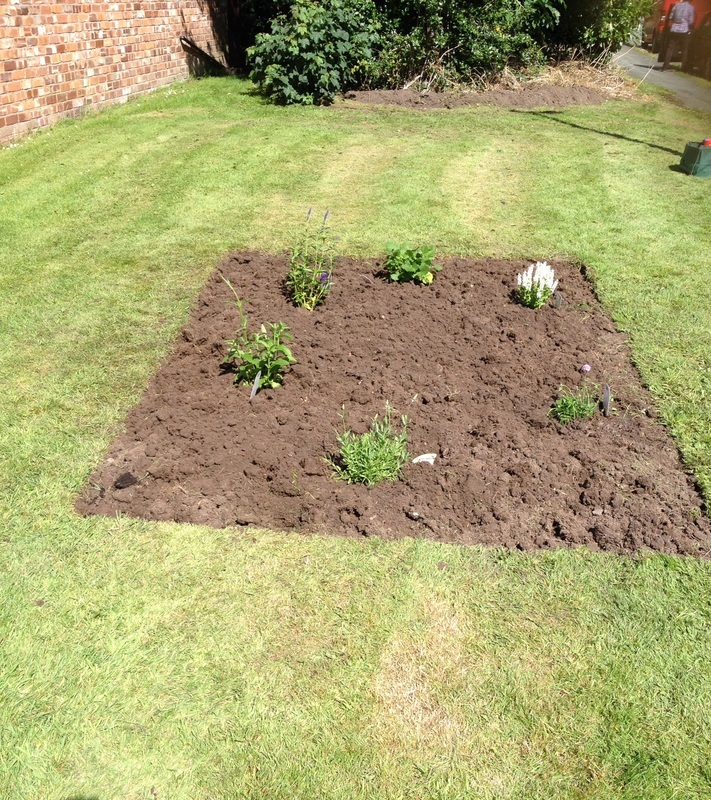 After months of planning, we were able to start creating the garden which is now situated in the grassed area on the corner of Moor Lane and Arlington Crescent. 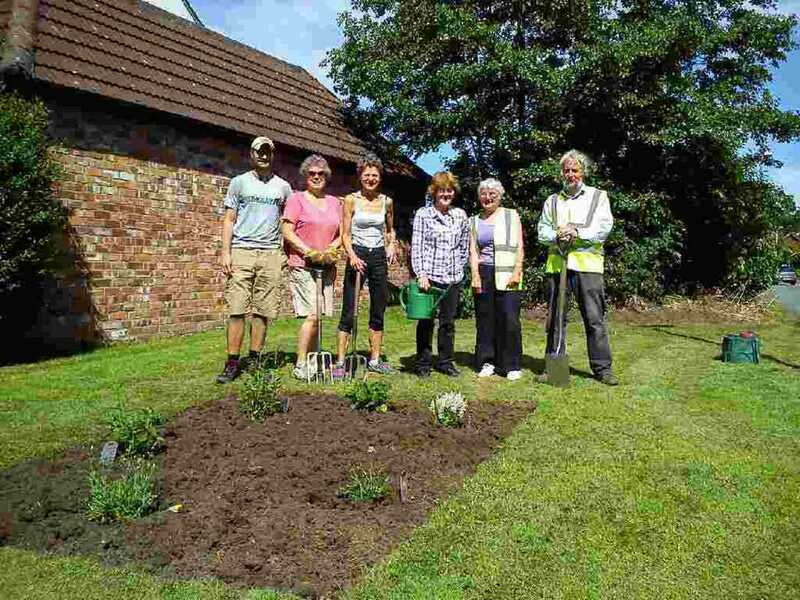 Jennie and her husband Maurice have been leading this project, and Gail, Sheila, Amanda and her son Barnaby, all came along on Friday to help with the manual work. 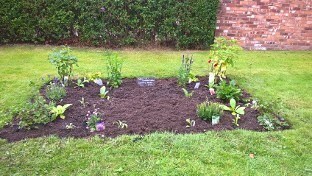 We planted several plants in the garden and some fruit bushes, the WI Centenary Rose and a tree will all be added soon. The photos show the day from start to finish. Dot, Obviously Delighted with her New Iron! 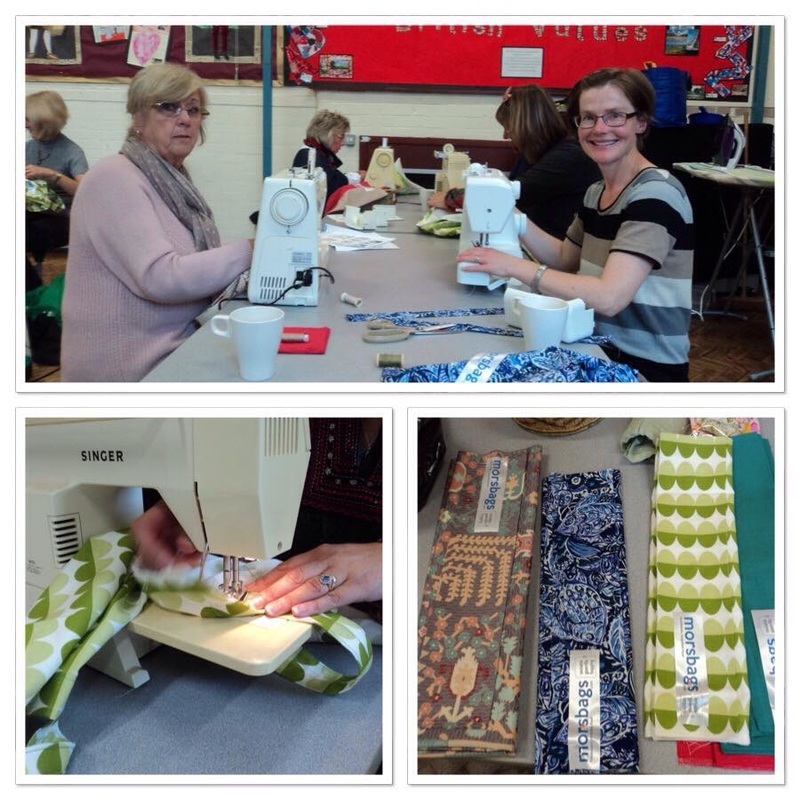 Fulshaw WI were invited by Ruth Lennie, a colleague of one of our former speakers, to road test the brand new Breville PressXpress Iron and 12 of us volunteered to help. We went along to the Company headquarters on Cheadle Royal Business Park, armed with our own irons and some clothing in need of ironing. After being treated to home made chocolate brownies and courgette & lemon drizzle cake, both cooked in a slow cooker (a first for all of us! 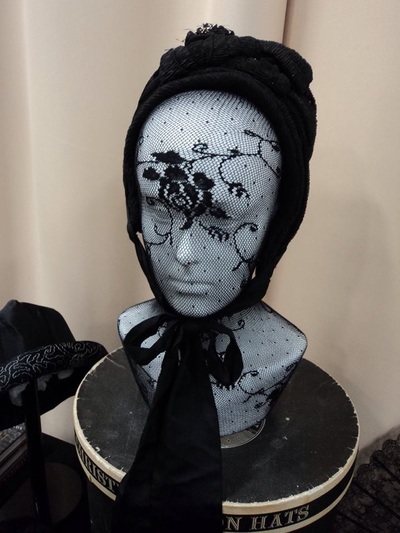 ), we were invited to try out the iron and appreciate its many new features. We were all very impressed and some of our own irons were definitely relegated to the bin, especially as we were each rewarded with a brand new iron to take home! We hope that we will be given the opportunity to help out again. On Wednesday 24th June, 8 ladies set off from the Rifleman's at 10.00 am for a bike ride to Jodrell Bank. This was one of our longer rides of the year as it was a round trip of just over 20 miles. This meant we had the perfect excuse to stop for lunch at the Jodrell Bank Café for lunch. The weather was glorious and so we were able to sit outside and enjoy the sunshine whilst eating lovely food and having a good old chat. As usual, we explored parts of Cheshire we had not seen before and we are grateful to Jane for planning and leading such brilliant bike rides. Ladies that visited the Cheshire Show and in particular the WI tent, said what a fantastic day it was. The pictures below show the Fulshaw bunting and banner that were on display over the two days. A special thanks to Jennie Palin for creating these magnificent pieces of craftwork. Alexandra Devlin, operational governor from Styal Women’s prison, gave us a very absorbing and immensely interesting talk about how the prison is run, covering every aspect of the lives of the female prisoners. Alex has been in the prison service for 18 years since she joined at the age of 27. She is passionate about helping to rehabilitate offenders and preparing them for life in the outside world after ﻿they have served their sentences. Of the 130 prisons in the country, 11 of them are solely for women and all categories of female prisoners are held in the same prison, whereas men are housed in specialist prisons. Of the 88,000 beds in the country, 84,000 are now filled and Styal itself is very close to capacity with 473 out of 485 beds occupied. The female prisoners are aged from 18 to 80 and they ﻿﻿all have a range of needs that have to be met. There are 16 ‘living units’ with rooms of single or double occupancy. There is a mother and baby unit for up to 9 women and 10 babies. There is a ‘lifers’ unit for long term prisoners, a drug recovery unit and an ‘assisted living’ unit for older women and home helps for special needs inmates e.g. strokes or blindness. There is a punishment block (sole occupancy). Alex explained how clothes have to be provided for the women as they don’t wear uniform and after their first two weeks they cannot be given them by family or friends and most of them have no-one to send them clothes anyway. The women live in units with up to 4 in a dormitory with 28 women sharing a bathroom with 3 toilets, 1 bath and 3 or 4 showers and there is no privacy as doors have no locks. The prison is like a small ‘town’ and everything has to be provided on site. Education is provided by Manchester City College to GCSE level and Open University courses are available. They can also learn many skills e.g. gardening, bee keeping, waste management, gym training, catering, and beauty treatments – all skills that can be taken back into the outside world on release. There is on site provision for a dentist, doctor, podiatrist, pharmacist, solicitor, barrister, bereavement counsellor, hairdresser and a multidenominational chapel. BUT – advantages have to be earned as many of these are rewards for good behaviour. REALITY – the prisoners are ‘incarcerated’ and they have to learn skills to be able to change their lives on release as so many of them have been extremely deprived all their lives before they came to prison. On the serious side, many self-harm, many are violent and/or aggressive and some will never be rehabilitated. Alex told us that she had had her arm broken twice; she had been assaulted and quelled fights in full protective gear and riots that involved some appalling behaviour. The Styal moto – is ‘building hope and changing lives’ and Alex told us she is exceptionally proud of the work she does and of the 111 talented staff that work for her. They need to have a ‘warped sense of humour, to be able to work as a team and to be able to laugh in adversity and to be able to deal with every emotion’. Staff are forever mindful of the victims on the outside and they are striving to drive down the reoffending rates. CLINK – there is now a restaurant at the prison called Clink that is open to the public and many of the chefs and waitresses are inmates who are on the open part of the site and who can go out into the community, while returning every night. Clink is a charity started in 2010 with a number of prison restaurants around the country. Libby is both an inmate and a trainee chef at Styal who had come to the WI with Alexandra and Libby gave us a short talk on Clink and her work as a chef in Clink. Libby told us how much this opportunity meant to her and she is planning to become a chef after her release next April. Working in the Clink restaurants has been shown to reduce reoffending rates. Libby was very plucky to stand up in front of 70+ WI members and she did herself and Alexandra proud! The talks ended at 9.25pm and the members gave Alexandra and Libby a resounding round of applause for such well delivered, thought provoking and above, all interesting talks. Styal prison has always been ‘behind closed doors’ for us, the public, but now we felt we had had a swift glimpse inside to help us appreciate the amazing work that the staff do to rehabilitate and look after inmates. 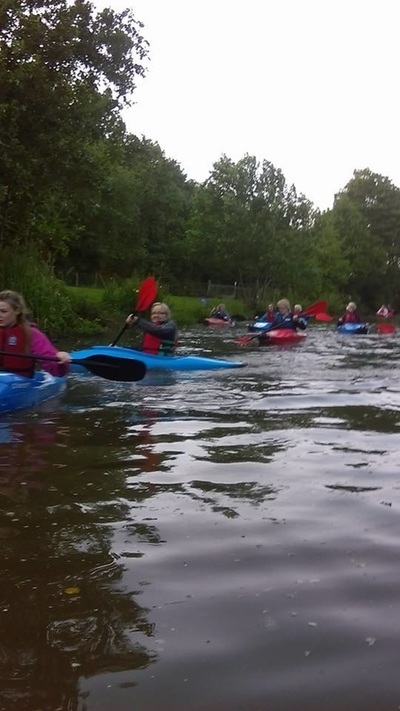 On Tuesday 9th June, a lovely sunny evening, seventeen people set off from the Old Dancer Pub in Wilmslow on an orienteering event. The evening, which had been organised, as last time, by Kate and Dave, was based around Wilmslow town centre and The Carrs which gave everyone the opportunity to explore this area with an eagle eye for clues. Donna and Andrew won the competition and proved to be competitive duo. Jane and friends were the runners up and Wendy, Amanda and Maggie came third. 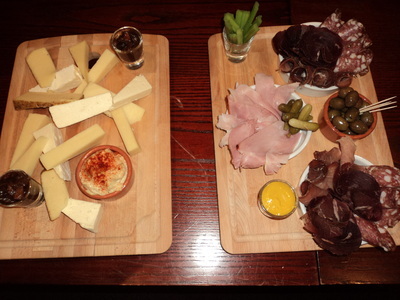 Once everyone had returned to the pub, they enjoyed a well-earned meal and drink. Wow what an amazing day. Great speakers, namely Lucy Worsley, Tanni Grey-Thompson and Helen Morrisey. HM The Queen, HRH The Princess Royal and HRH The Countess of Wessex were also in attendance. Lovely company with ten WI's at the Imperial War Museum watching the AGM. The Resolution not voted as it was felt that it was not workable in its current state. We were hooked up live, one of only three venues including Llanfair PG and Devon, and the ladies from Fulshaw were in full view! It was such a privilege to 'attend'. Click here to watch the full day on YouTube. Fulshaw appear after 5hours 38minutes. We are delighted to learn that Alison had a wonderful day when she attended the Royal Garden Party at Buckingham Palace on Tuesday 2nd June, thrilled to have been the lucky lady representing Fulshaw WI on the day. The evening began with a talk by Susan Flynn from Chifundo. She described the work of the charity and gave a short slide show. After the talk, there was a light supper of scampi and chips, followed by traditional Malawian biscuits served with tea and coffee. This was followed by a fashion show where models showcased some of the garments made by the women supported by the charity. Finally, there was the opportunity to buy a variety of Chifundo products including jewellery, bags, cushions aprons and clothes. We are delighted to report that a total of £557 was raised on the night, the most ever raised at a fashion show, and the money will be used to purchase some steam irons. A group of eager cyclists left the Rifleman's Arms at 12.30pm on Wednesday 20th May and headed towards the Merlin and then onto the A34. They left the by-pass and cycled near The Stag and then past the Frozen Mop at Mobberley, the Plough and Flail and then back to the Rifleman's where they stopped for a cuppa. Unfortunately Amanda had a puncture half way round but this did not stop everyone having an enjoyable bike ride. 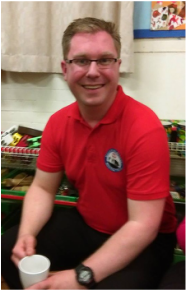 Matthew Stagg from Buxton Mountain Rescue (BMR) gave us an inspiring talk on the history of the Mountain Rescue Movement with particular emphasis on the Peak District National Park where he is a volunteer. Matt explained that volunteers have to be relatively young and fit and are in a range of professions. They have to be available at all times of the day and night and employers have to allow flexible working hours to accommodate emergencies during the working day. Matt is an anaesthetist working on cardio-thoracic operations as well as a trauma specialist and so is an essential member of the team, which has 5 medics on the list of volunteers at Buxton. We watched a video describing the call out procedure and the work the BMR is involved in and we saw how dogs can find people, dead or alive, more efficiently than people can. Volunteers have to 'drop everything' and respond (eg. leave family parties, leave their beds or work), as time is of the essence to prevent suffering and save lives of people in many difficult and often dangerous situations. BMR responds in wild, and even rural, places to search for lost people, rescue animals, assist ambulances, cover events, swift water rescue, body recovery and many other emergencies. 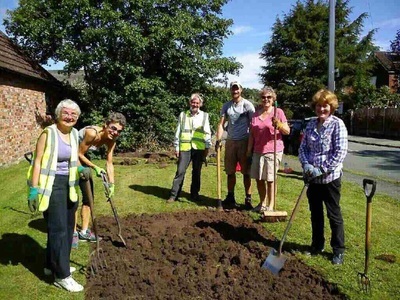 There are 48 teams in England and Wales and over 3,000 volunteers. The Mountain Rescue team in Buxton was set up in 1964 following a number of fatalities. There are 7 teams in the Buxton area that overlap. Vetting new members takes 24 - 48 months before members are fully trained to deal with all emergencies. There are weekly and three full weekend training sessions in the year. Volunteers have to help with fund raising as it costs £23,000 each year to run the Buxton team. In 2012, they spent a total of 1,700 hours on rescue missions! We saw photos of the 4 dogs they use which are owned and trained by the volunteers at their own expense. Matt recommended a book to us - 'Mountain Rescue' by Hurst and Bennett that explains everything in more detail. Matt took lots of questions as WI members were intrigued and hugely impressed by the work done by Mountain Rescue Teams. Matt was warmly applauded for his very thorough talk that opened our eyes to the unsung heroes that are available at a moment's notice to rescue the unwary and the unlucky. It might be any one of us at any time.................food for thought indeed! 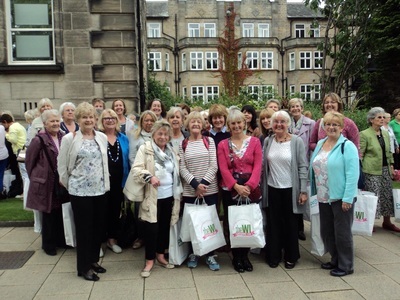 Nineteen ladies spent a delightful afternoon at Macclesfield College recently. We were treated to a delicious array of sandwiches, homemade cakes and freshly baked scones with cream and jam. Pimms or a strawberry cocktail were also available for those ladies that wanted to add even more decadence to the occasion. All the food was prepared and served by the students of the College. We had a great afternoon and look forward to visiting the College on future occasions. Five ladies had an hilarious night out watching 'Raising Agents' at Eccles Town Hall on Friday 8th May. 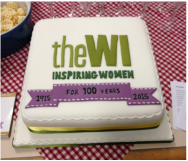 It was a production given by the Mikron Theatre Company to celebrate the WI Centenary. The four members of the cast, which included two men, portrayed ladies of the WI over the ages and entertained us with both song and spoken word. 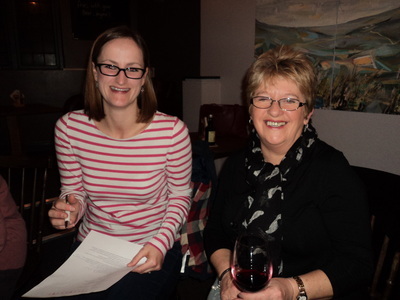 A total of £1,500 was raised on the evening for the local charity, Salford Loaves and Fishes. Eleven members enjoyed a visit to Stockport to visit two excellent museums run by Stockport MBC. It was incredible to see so much interesting history in our vicinity and the lunch in the middle was pretty good too........ Lots of catching up and chatter as usual, but thanks to Jane for making us just a little more informed on local history in such an enjoyable way. Despite a disappointing turnout, we enjoyed a lovely walk around Tatton Park on Saturday 25th April 2015. We were delighted to welcome friends from The Heatons and Didsbury WIs as well as 2 dogs and a husband! We experienced all types of weather on the 5 mile walk, including sunshine and showers. The route took us to places that most of the walkers hadn't visited before and we stopped off midway round for a picnic under the trees. All money collected on the day will be donated to ACWW. Amanda Manson from ‘Orderly Home & Office’ gave us a fascinating talk on how to ‘declutter’ and improve the way we live our lives. Amanda started by asking us to close our eyes and imagine what ‘clutter’ means to us all! Amanda put into words what most of us thought i.e. clutter is ‘a disordered heap – a mass of objects or anything that stops you doing what you want to do’. William Morris said ‘Have nothing in your house that you do not know to be useful or believe to be beautiful’. Apparently householders have on average 32 arguments per year on clutter and 30% of household items may be ‘clutter’! Amanda herself has helped many clients to downsize, move house, sort out possessions and find storage solutions. She also advises on how to recycle and get rid of items. 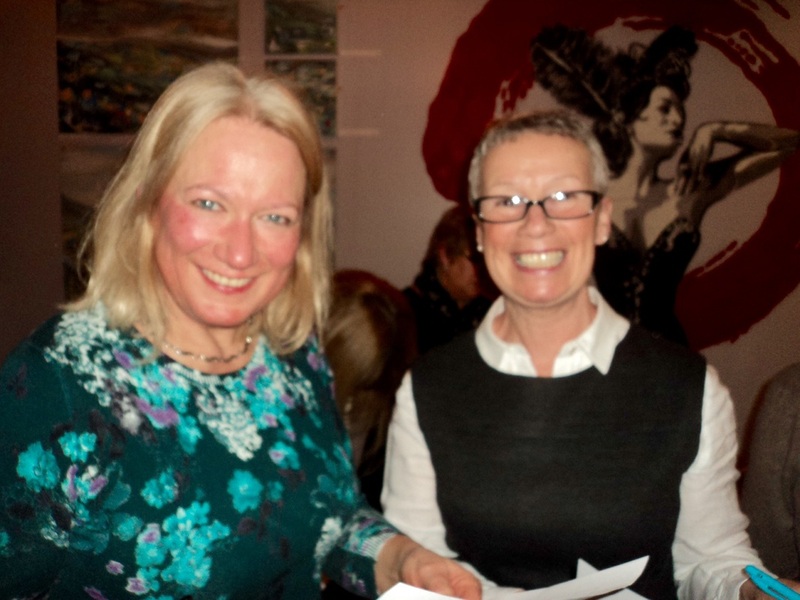 Amanda is a member of The Association of Professional Declutterers and Organisers (APDO) which was set up in London 11 years ago by 4 ladies and now it has 100 members. Amanda showed us all some unforgettable images of rooms in houses that have become totally cluttered e.g. a child’s playroom, an office, a dining room and even a kitchen. Amanda helps and advises her clients by working out a system of storage but it is essential to sort and ‘get rid’ of things before storage. She showed us lots of helpful gadgets for storage. The very thought provoking talk ended with a few ‘handy hints’:- 1) decide what your end goal is. 2) Decide ‘do I use it, do I need it, or do I love it’ before acting 3) ‘make the time to give yourself time’. Amanda can be contacted via ﻿www.orderlyofficeandhome.co.uk . Many of us went home with resolutions of our own for reorganising and decluttering, after all it is spring! 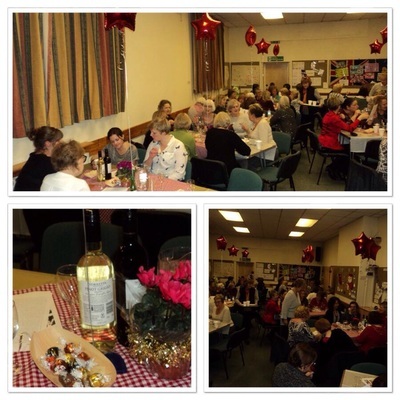 Seven ladies from Fulshaw enjoyed an amusing talk given by Lydia Slack at Woodford Community Centre on Wednesday evening. 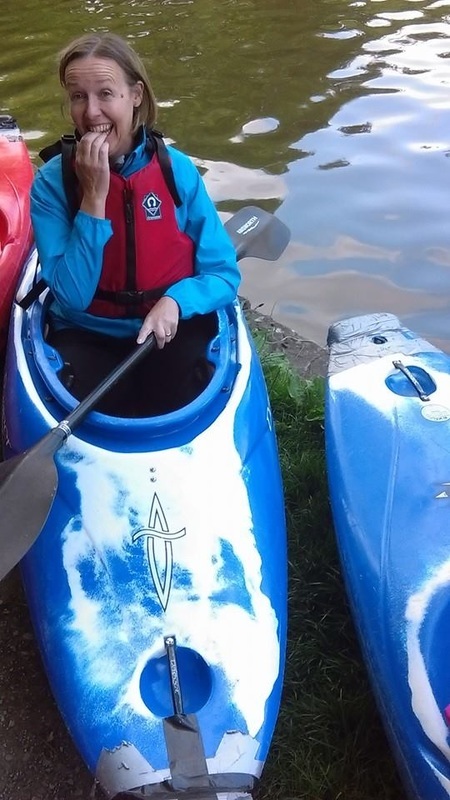 Lydia told us many amusing tales from her childhood on a sheep farm in the Peak District National Park, through to her young adult life Swaziland as a volunteer English teacher and would-be netball player and finally her life as a graduate and post-graduate. After Lydia's talk we were then entertained by each of the WIs present including a highly amusing rendition of WI Life, a poem by Philippa Aitken, given by Wendy Morris. What fantastic weather the 8 ladies, 4 boys and 1 husband had when they went on Jane's walk on Tuesday afternoon. 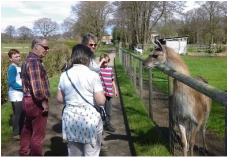 They walked across Alderley Golf course to Foden Lane and back, visiting the alpacas en route. After this, they enjoyed some well earned ice creams and tea at the Rifleman's. 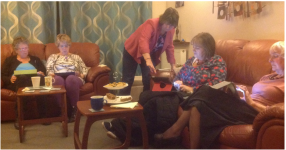 A group of ladies met on Tuesday 24th March for another of Diane's iPad training sessions and also enjoyed Jane's homemade cakes. It's amazing that however much we use our iPads, we always manage to learn something new! We appreciate the effort that both Diane and Jane put into hosting these evenings. Whoever would guess this was once just a chocolate egg! Sweet Sensations gave us a very enjoyable and memorable evening showing us how to decorate small chocolate eggs for Easter! We were all provided with two chocolate eggs each and two balls of fondant icing each and some liquid chocolate and plastic knives, forks and spoons to help us in our project for the evening. 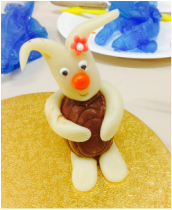 Our mission was to make an Easter bunny and ‘one other’ decorated egg. Demonstrating to ~50 ladies is no mean task but we all quickly picked up the techniques needed and we produced 50 individually crafted Easter Bunnies to take home to surprise and impress our families and friends. The more imaginative members designed their own second egg e.g. Princess Leah’s head complete with wonderful hairstyle (Hilly) and an impressive horse’s head (Jane). Most of us copied the little Easter duckling which in itself was challenging enough! Seventeen members and friends enjoyed our first Dabble Day. An array of patchwork fabrics, felts, buttons and trimmings were available to create some really innovative craft items. More experienced folks helped beginners and everyone agreed that they had a lovely day just chilling out and eating delicious refreshments provided by Dee. (Aubergine bake, chicken, baked brie, salads, french bread and a wonderful assortment of desserts and cakes). 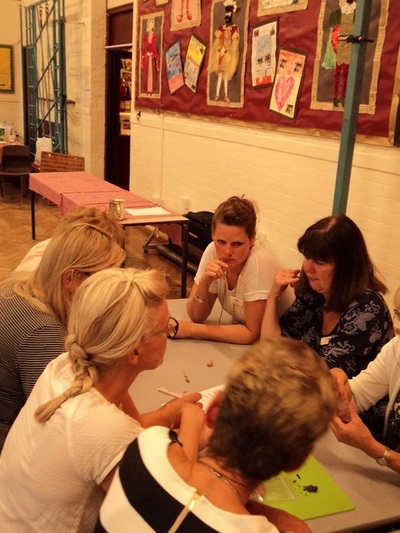 Many thanks to the Committee and to Kate Hopwood for their help in arranging the first of these "in-house" workshops. 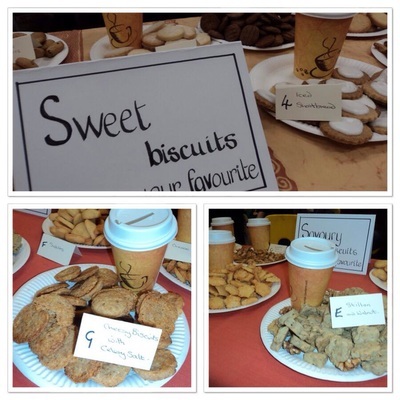 A big thank you to the eleven ladies who baked cakes for the Wells for Africa Souperday. They looked beautiful. It was lovely to be able to support this very worthwhile local charity in a practical way this year. The book club met on the same Thursday evening as the walk, and we had a great turnout of ladies, some regulars and we were delighted to welcome some first timers. The book was ‘An Unsuitable Job for a Woman’ by PD James, which was chosen following her recent death. A group of 6 ladies, plus Harry the dog, set off from the Riflemans Pub on Thursday 12th March for a walk led by Jane Rawlings. As always, she took us on a new route, this time out towards Mobberley Golf Club, and we saw parts of Wilmslow we had not been to before. The weather was kind to us as it did not rain although we did encounter lots of mud! 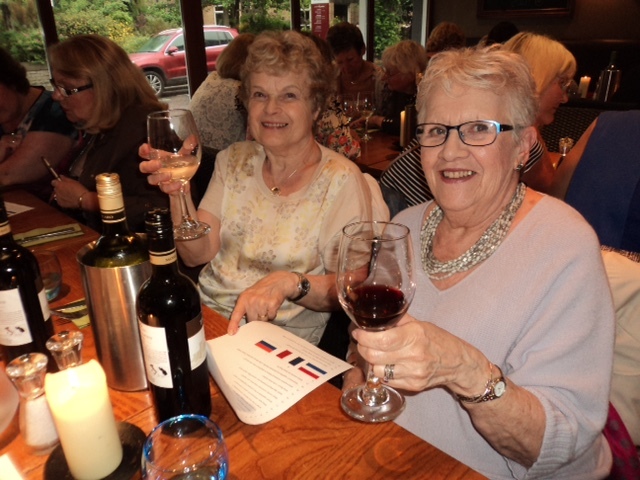 Nineteen members enjoyed a main course Italian meal at Fina followed by a viewing of "The Second Best Marigold Hotel" at The Heritage Centre Macclesfield on March 3rd. We are sure to continue our Cinema outings, but may investigate alternative restaurants in the future perhaps to give us a taste of alternative cuisines. Meanwhile we are all wondering where we can find a tutor so that we can master that Indian dancing! Almost 30 ladies attended the new members evening which was held at the Old Dancer pub in Wilmslow recently. 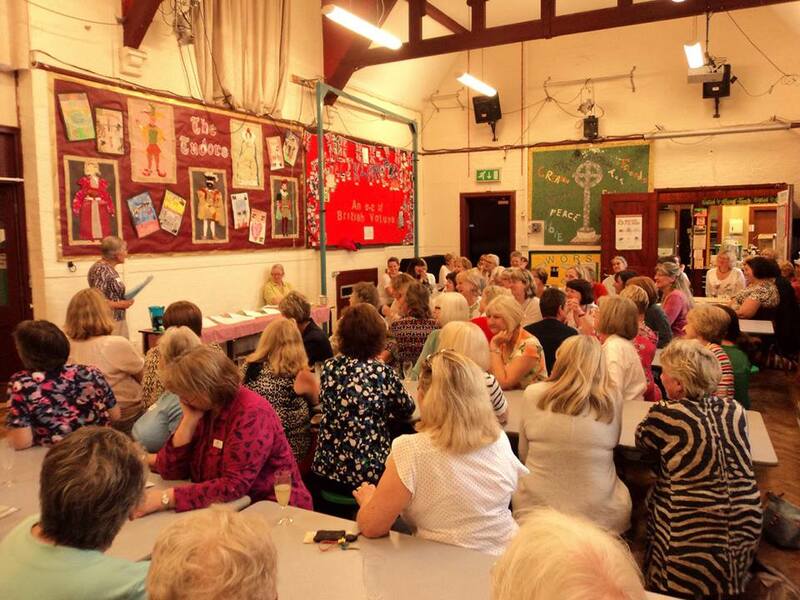 Wendy welcomed everyone to the evening and gave us a short talk about the WI and also about Fulshaw and all the many different activities that have taken place over the last two years since she joined. Next we split into teams for a 20 question general knowledge quiz and then, to help everyone get to know one another, we played 'people bingo'. This involved filling in someone's name who met the specified criteria in as many squares as possible. 'Likes photography', 'can read a map', 'has lived abroad' were just some of the characteristics we were looking for and who would have guessed that two of the ladies present had 'been in a wardrobe with someone famous'! Lastly we rounded the evening off with some delicious platters of cold meats, cheeses, hummus and assorted breads. We hope everyone enjoyed the evening and that some new friendships will have been forged. The speaker this evening was Terry Webb from ‘Hearing Dogs for Deaf People’ assisted by June who was profoundly deaf and her helper dog ‘Paddy’. 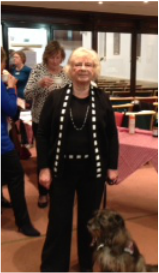 Terry talked to the 50+ WI members present on the Aims and Objectives and operation of the charity. Deafness is a very isolating condition and sufferers can become extremely lonely, and a trained hearing dog will provide independence, confidence and companionship. One million people in the UK have hearing loss and 800,000 are severely or profoundly deaf. The charity started in the UK in 1979 and now they breed their own dogs and the puppies are trained in two centres (High Wycombe & Bielby near York). The breeds used are cocker spaniels, poodles, golden retrievers and crosses between these breeds. At 8 weeks old the puppies go to a home to live with a puppy ‘socialiser’ then at 14 – 16 weeks old they have one to one training. 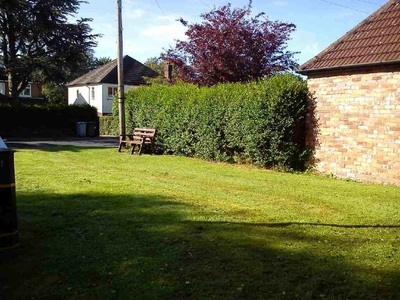 A new puppy socialising centre is soon to be set up in Cheshire. Dogs are trained to alert their owners to sounds e.g. the doorbell, smoke alarm, telephone, baby alarms etc. Dogs alert their owners by pushing their knee with their nose and then taking the owner to the source of the sound. The dogs are carefully matched to their owners to get the best partnerships but the waiting list for a first dog is 2 years as the demand is higher than the supply of trained dogs. Deaf children can now have dogs as well as adults. There are now ~800 dogs working and altogether since the start of the charity, 1600 have been trained and deployed. 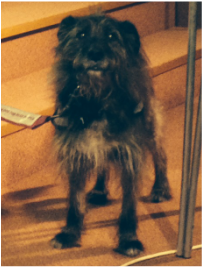 June then gave a short tribute to her Hearing Dog Paddy who came along to the meeting. Paddy was an older (now retired) shaggy haired ‘mutt’ who had been a rescue dog who had been trained and June was very articulate in explaining how Paddy had given her freedom and confidence when she had been totally deaf. June now has a cochlear implant which has given her some hearing. Paddy was a bit of a star and loved the attention! Twenty three members enjoyed visiting this historical site in the heart of Manchester. 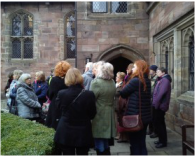 We had a home made lunch of soup and sandwiches, a concert given by four very talented pupils and a tour and talk of the buildings including the Chetham’s Library which is open to the public. A group of eager pupils attended the iPad Training session on Monday 2nd February, hosted by Jane and taught by Diane Atkinson. 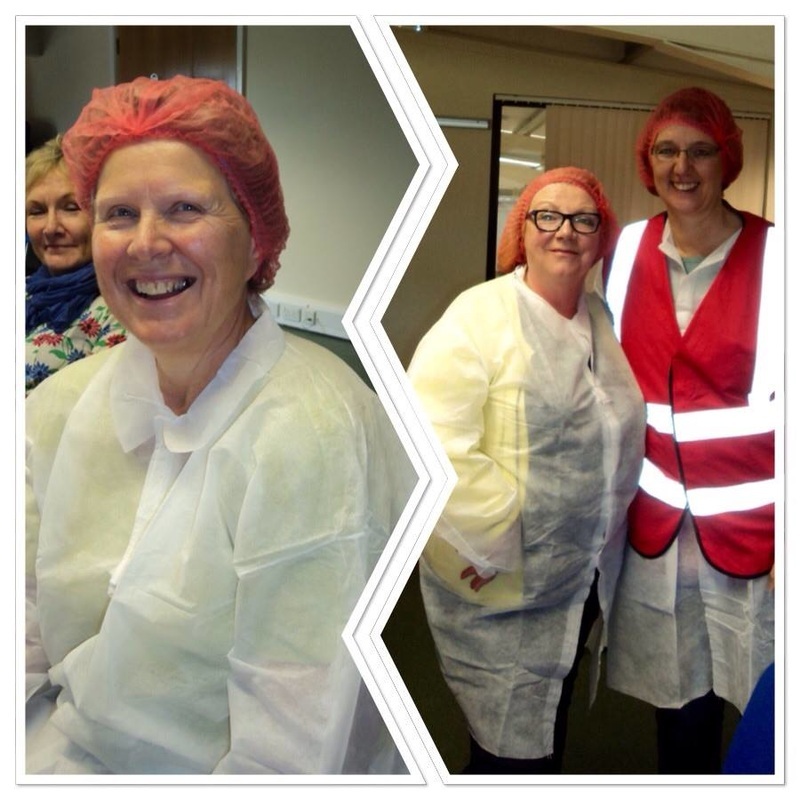 We all gained valuable information and tips as well as enjoying Jane’s flapjacks and chocolate fudge cake. Despite the awful weather, a brave 13 ladies turned out to discuss this month’s Bookclub choice, Appletree Yard by Louise Doughty. The book got a definite ‘thumbs up ‘ from everyone present, although the discussions and debate about the book demonstrated how many of us had different interpretations about the motives and characters of the book. A big thanks to Anne Kerr for choosing this slightly racy and thought provoking book and for leading the questions. We had a good turn out for our afternoon walk on Tuesday 27th January including 3 new members Doreen, Pat and Margaret as well as Harry the dog. 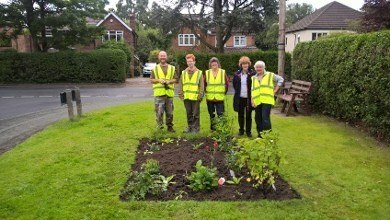 Led by Jane, we left Lindow Common car park and headed over to Morley Green Nursery Cafe where we enjoyed tea and cakes. A short walk brought us back to the car park in time for the school run. Thanks Jane! Despite below freezing temperature, there was an excellent turnout of 50 members and 8 visitors for the first meeting of 2015. 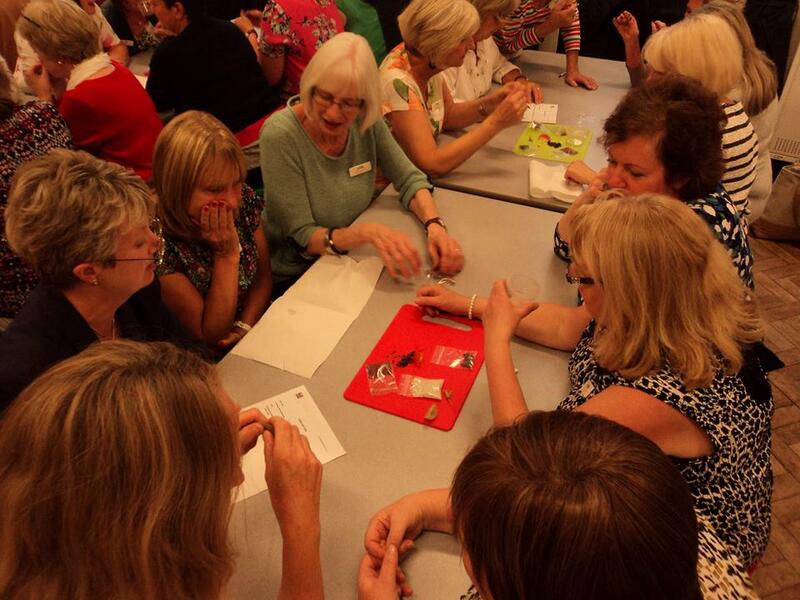 Whilst sipping a champagne cocktail, members cast votes to select the topic that Fulshaw want the WI to campaign for this year at national level. People also took advantage of a new ‘events table’ where they could sign up and pay for forthcoming events. President Wendy Morris welcomed new members and visitors before introducing the speakers Rachel and Steve from Pro-Fit Personal Training. They had agreed to step in at short notice following a cancellation. Pro-Fit work at Total Fitness, Handforth and the Cottons Hotel in Knutsford. Their support combines exercise, nutrition and motivational coaching to help people achieve their personal goals whether that is to lose weight, overcome injury or train to run a 10k race! They talked about how crucial posture is and encouraged the entire audience to assess and measure their own posture. Pro-Fit offered a discounted assessment session for the first 12 members who signed up, this led to a stampede at the end of the meeting! The meeting closed with tea, coffee and an excellent selection of homemade cakes which included healthy brownies made by Pro-Fit Rachel. They contained no flour or sugar but the secret ingredient was sweet potato.